Posh striker Shaquile Coulthirst on the stretch against Burton. Photo: David Lowndes. League One is a dismal division this season, but little Burton Albion have cracked it. Sadly Peterborough United, with far greater resources at their disposal, are floundering 16 points and seven places behind the smallest club in the competition. A young squad and their fluid playing style appears to have been rumbled. To be honest it was ever the case as far as the dominant sides have been concerned. Posh substitute Lee Angol in action against Burton. Photo: David Lowndes. This dreadful display means Posh have taken just two points from eight meetings with the current top five, a worry when beating the sides around you is often a key to success, and particularly so last night (January 26) as Burton’s defensive organisation and midfield competitiveness was enough to ensure one of the more comfortable 1-0 wins they will ever achieve. The (small) size and (lack of) history of Burton will doubtless be used as a stick to beat Posh with in the aftermath, but that would be unfair on Nigel Clough’s men. His side’s three previous away matches in League One yielded wins, without conceding a goal, against Wigan, Gillingham and Coventry, three of League One’s big hitters. It wasn’t therefore a shock result at the ABAX, it was just a continuation of season-long form, although Posh have at least made the other promotion contenders work for their wins. Last night there was no tempo, no vision, no cohesion, no plan B, no strength, no defensive quality, no gumption and, most worryingly of all for a Graham Westley side, no passion. There was also no Conor Washington, although his absence may be a large red herring, notwithstanding a perhaps understandable lack of understanding between midfield and attack. Posh have lost to the top two since their top scorer deparated, but he played against other leading sides in games that were lost this season. 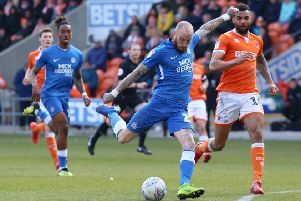 He was also present for the majority of a current run that now reads two wins in seven League One matches and four games in eight when Posh haven’t scored, including the last two home games. Posh midfielder Erhun Oztumer tries to find a way past the Burton defence. Photo: David Lowndes. Posh have struggled to counter teams that set out to stop them playing in the sure knowledge that they will still create chances to score at the other end. No wonder Westley kept his side locked in the dressing room for 40 minutes after this match and no wonder he emerged to use words like ‘embarrassed’, ‘inadequate’ and the always reliable ‘rubbish’ in his post-match press de-brief which also included a personal apology as well as one on behalf of the team. Only the wisdom and honesty eminating from the press conference distinguished this display from one of those in the early part of the campaign under a different Posh manager. Given the relative season-long trends, and you can throw their general uselessness on Tuesday nights into the mix, the last thing Posh needed last night was to gift-wrap an early goal. But they did in the third minute as Harry Toffolo, whose night was to get much worse, lost possession in the middle of the park, enabling the impressive Mark Duffy to skip past the deeply unimpressive Jack Baldwin and cross for an unmarked Tom Naylor to tap into an empty net. Toffolo felt he was fouled, but referee Tim Robinson didn’t point in the home side’s favour for most of the game. His was a performance as mystifyingly inept as that of the Posh players, but he shouldn’t be blamed for the result or the home display. Westley felt his side lacked desire rather than ability. Certainly Burton’s battlers couldn’t be accused of lacking either. Tackling is a skill every bit as useful as the ability to unpick a defence with a pass. A three-goal half-time lead wouldn’t have flattered Burton and, although they barely bothered to venture out of their own half after the break, their narrow lead was never threatened. Visiting goalkeeper Stephen McLaughlin had just one testing moment all night when turning Marcus Maddison’s shot behind for a corner eight minutes before the break. Burton on the other hand were denied further first-half goals by Ben Alnwick’s agility in the Posh goal. He thwarted Naylor, after a horrible pass out from the back by Ricardo Santos, Duffy and, most impressively John Mousinho from a corner. Neither ‘keeper was extended after the break as Posh lost their way so badly they started shooting from 35 yards, more in hope than expectation. Maddison, who switched from a very advanced forward position to left-back after Toffolo was carried off with a head injury, did deliver the odd decent cross, but all were expertly dealt with by Burton’s excellent defensive unit. It was an awul game, in awful conditions and awfully officiated in front of an awful crowd. One to forget for Posh, but credit to Burton for showing that defensive organisatiion and discipline can be as equally effective as slick attacking play. Their charge towards a second successive promotion is one of the stories of the Football League season. However Westley has work to do including a rapid integration of new players (it was a surprise that Adil Nabi wasn’t handed a home debut at some point), a change of formation that might catch opponents on the hop and to turn ball-players into players equally happy to mix it physically. Michael Bostwick’s return can’t come soon enough. Posh: Ben Alnwick, Michael Smith, Harry Toffolo (sub Lee Angol, 45 mins), Ricardo Santos, Jack Baldwin, Chris Forrester (sub Souleymane Coulibaly, 70 mins), Harry Beautyman, Erhun Oztumer, Jon Taylor (sub Martin Semuelsen, 63 mins), Marcus Maddison, Shaquile Coulthirst. Unused substitutes: Dion-Curtis Henry, Jordan Nicholson, Lawrie Wilson, Adil Nabi. Burton: Stephen McLaughin, Phil Edwards, Shane Cansdell-Sherriff, John Mousinho, Robbie Weir, Stuart Beavon (sub timmy Thiele, 63 mins), Lucas Akins, Calum Butcher (sub Anthony O’Connor, 90 mins), Damien McCrory, Tom Naylor, Mark Duffy. Unused substitutes: Stephen Bywater, Abdenasser El Khayati, Aurelien Joachim, Marcus Harness, Sam Austin. Goals: Burton - Naylor (3 mins). Cautions: Posh - Baldwin (foul), Samuelsen (foul). Burton - Weir (delaying the restart). Alan Swann will be at the ABAX Stadium for the Peterborough Telegraph so follow all the team news, LIVE commentary, match report and match reaction here click here.